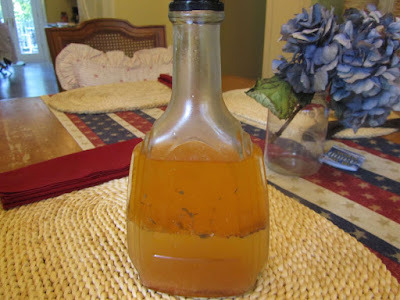 Each summer, I make a couple of types of herb vinegars, to use on salads and in cooking. A favorite of mine is rosemary vinegar. But I also make chive blossom vinegar and thyme vinegar. I always have lots of white vinegar on hand, and plenty of herbs in the garden to use. But I never seem to have enough bottles for my homemade vinegar. I wind up giving away some of my bottles to friends who are interested in making herb vinegars with me. 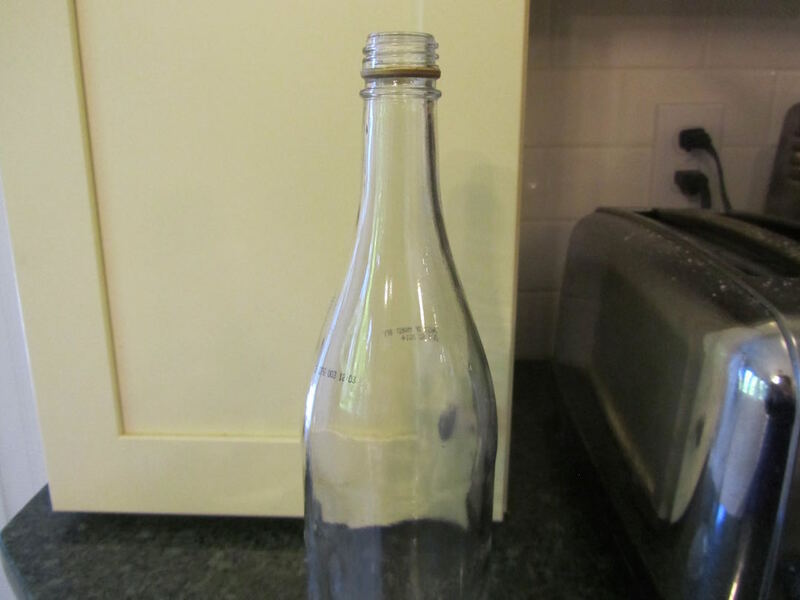 So, in winter and spring, I begin "collecting" bottles that I think will work well for storing and pouring vinegar. Here's another bottle, from sparkling apple cider. The name brand of sparkling apple cider that I see on sale during the holidays, uses a green bottle. But this particular brand uses a clear one, which I prefer for vinegars. I just gave away a smaller 16-oz bottle. It had contained commercial white-wine vinegar. That bottle was a good size for the vinegars that I only make in smaller quantities, like sweet blueberry vinegar. When I had a couple of friends over to make chive blossom vinegar, recently, one friend asked me where I got my bottles. I explained that while she could buy bottles at World Market or a thrift store, she could also look around her kitchen for bottles about to go to the recyclers. A lot of beverages, sauces and condiments still come in glass bottles. Some of these bottles have a shape that looks right for storing/pouring the vinegar. While others have a look that I like for storing homemade salad dressings. This is a brandy bottle, from making brandied cherries 2 summers ago. It looks just right for my homemade vinaigrette, don't you think? when one of my daughters came into the kitchen one day, she thought I had bought bottled salad dressing, that is until she noticed there was no label. I could store homemade dressings in canning jars (and I do from time to time), but I do like how dressings pour so easily and neatly from a bottle with a narrow neck. Occasionally, I have a bottle that's missing a cap. Bottles that I buy second-hand often come without caps or stoppers. A couple of years ago, I bought a small bag of corks at Cost Plus, for about $2. The bag had about a dozen cork stoppers. Craft supply stores also carry cork stoppers. Or, you could save one (or ask a friend for one of theirs) from a used-up bottle of wine. The other option to buying cork stoppers for bottle lacking a cap, is a plastic cap from any other bottle. If it's a screw-top bottle that you need a cap for, check other bottle caps about to be tossed, to find one that fits. Those green sparkling apple cider bottles that I mentioned above, come bottled with a metal cap that you use a bottle opener on, not reusable, but they also have a plastic pop on, pop off cap, for resealing the bottle. These plastic caps work well on many repurposed bottles from the kitchen. Great way to reuse them! I am currently reading the book Zero Waste Home which has been fascinating. We have no glass recycling here so using anything we can to keep it out of the landfill is a bonus in that regard, as well. You know, I hear that from others that recyclers aren't taking glass these days. Ours still does. One of my daughters was describing some repurposed glass bottles, wrapped in twine that were used as table centerpieces for a country-style wedding. We thought about using some glass jars to do the same sort of thing, for hurricanes for votive candles or as vases for daisies for the kitchen table, this summer. Only I don't have twine, but do have raffia. We'll how that looks -- could be cute. 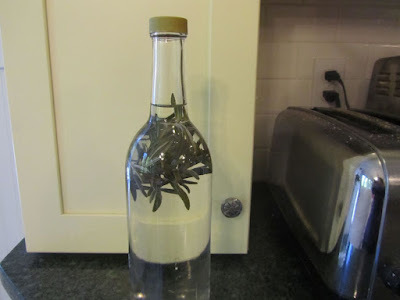 I often re-use glass bottles for homemade vinegars and salad dressings, and agree wholeheartedly that the narrow neck bottles are much easier to use than canning jars for serving. Thank you for the comment about corks. I hadn't thought of that for bottles that don't have "lids". Brilliant idea. That narrow neck makes a huge difference when I'm trying to pour neatly! And it looks more hospitable, if I put out bottles of dressing, instead of jars, for others to help themselves with, I think. 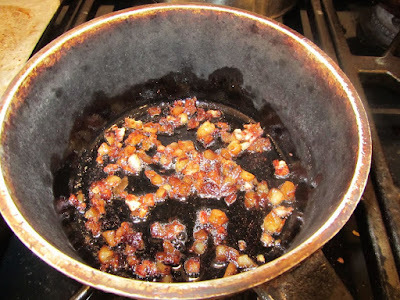 I often see recipes that call for balsamic vinegar, but to be honest I don't know the difference, so I substitute with white or cider vinegar. Is there a huge difference? And where in particular do you use these herbal flavored vinegars? Thanks!! I must admit, I am definitely not the person to ask about whether or not balsamic vinegar makes a huge difference. I've only used balsamic vinegar a couple of times, and don't ever actually buy it (due to cost). Maybe some day I'll buy some, but for now, I'll stick to homemade flavored vinegars. So, what I do with these -- fruity vinegars are good on spinach salad, or mixed with mayo and whipped cream for fruit salads. Herb vinegars, I use in oil and vinegar salad dressings. Sometimes I add some garlic powder and salt to the oil and herb vinegar. The cost to make this sort of dressing is about 25 cents for 8 ounces (oil, home-flavored vinegar with garden herbs, salt and garlic powder), so much cheaper than seasoning mixes for making dressing or bottled dressings from the store. I also use herb vinegars to add flavor to soup (love it in minestrone), gravies and sauces for meat. Basalmic vinegar does have a bit different flavor than white or apple cider vinegar, and it has a lovely dark color, that makes an oil-and-vinegar dressing look very nice. My husband enjoys it in his salad dressings. I think that the flavor is most like red wine vinegar, personally. Unfortunately, a lot of basalmic vinegars (and I THINK most red wine ones?) have sulfites (maybe not always added, but present from the process), so they're not good for folks who are sensitive to sulfites. They also do tend to be pricier, especially for a good quality one. Lili, do you ever use apple cider vinegar for your flavored ones? I don't tolerate the "burn" of white vinegar too well, but like a touch of apple cider vinegar in things that need a little tart zip. I also sometimes make a citrus vinaigrette-- mostly lemon, orange or lime juice with maybe just a touch of vinegar. Lemon is a good liver tonic and easier on my digestion. Herbal and fruity vinegars (if not balsamic) sound interesting and I should try it in dressings. We make quick cider vinegar and oil dressings, adding salt and garlic powder and herbal vinegar will add so much flavor at so little cost. I remember the free Good Seasons cruet too...my favorite. I also have lots of bottles without caps, and lots of wine corks...but never thought to use them together. I have some nice bottles I have been saving just because, so I'm off to a good start. What a font of good ideas you are this morning! I used to use rice vinegar a lot, but haven't in years (fewer local shopping options where we currently live). I always liked the light taste of that! I'll have to pick up a bottle next time I go to the city, for variety. The sulfite information is fascinating, too. Who knew?! I'll definitely pass this along to some people I know. My mom really can't tolerate sulfites at all. 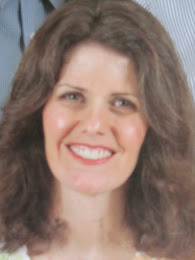 And thanks for posting a link from World's Healthiest Foods, because I had been meaning to go over there to check some listings for a young friend who just found out she needs to make a couple of major dietary changes. I keep forgetting to go, but I left the window open after reading your article, and will do my research first thing now! We occasionally have to buy a smaller, lower-quality soy when we're out camping or when my husband is cooking at the fire station. I'm going to try Lili's and your suggestion to try to pop the nozzle of one of those (or coconut aminos) out and refill it. Seems like it might work pretty well, if I don't mangle the plastic part getting it out and back in. Oh, and as a PS... I was thinking 4-gallon CASE, not cube. LOL Whoops! That WOULD be more of a problem to decant, Lili!!!!! The cube has a spigot. I do veg oil in 35-lb cubes, a little over 4 gallons. And man are those hard to decant, but a very good savings. So, I knew we were running low on soy sauce, but all this conversation about it brought it to the front of my mind (Thank you for that!!!). I went online to see what Cash & Carry's prices were, and what my options are, and the cube is more per gallon than a case of 4 gallon jugs. Both are on sale till next weekend. I checked my old grocery journals and found that I last bought 1 gallon of soy sauce May 2014. It looks like 1 gallon lasts us a little over 1 year. A case of 4 gallons would last 4 years. I'll check the sell-by date on the cases, but how long do you think soy sauce would keep if unopened? I'll be going by Cash & Carry again early next week when I go to the neighboring town. BTW, in May 2014, I paid $5.59/gallon, same brand, I could buy it at $4.47/gallon in a case. It would put me over our budget for the month, but not terribly so. And I would save in the long run, as soy sauce isn't one of those things that we tend to plow through just because it's there. Normally I put dates on everything I buy, so I can see how long it takes me to use them (because who can remember if you don't mark them... or you are organized enough to keep a purchase log like some of my fabulous LDS friends are). I didn't mark these,which must make it at least four years ago. I've been much more careful about that in recent years. We had started on our last of four gallons late last year, when my MIL gave us another of hers. So I now have almost three whole gallons that were all bought at that same time. I also have three unopened big glass bottles of Black Swan brand. I'm not worrying. Preppers usually put soy sauce on the list with sugar, honey, salt, freeze-dried coffee, etc. of foods that last, if not indefinitely, certainly with enough quality over a long enough period to always be worth investing in, if your family will eat them. As I mentioned, we've certainly never, ever had a problem with soy going bad., and unless I make a lot of jerky, we probably use about a gallon a year, too. Well, actually it's probably less than that, now that our sons aren't both home every summer anymore. But one a year was normal for us for several years. When they both lived at home, we used closer to two. Also, Lili, thanks for mentioning this right now. I buy coconut amino products for some special diet needs. They come in nice-sized bottles. I will have to save the next one I finish to use for a serving bottle for soy sauce, which we buy by the case. Thanks for your info on Balsamic vinegar. I've never used apple cider vinegar for a flavored vinegar base, but I'm sure it would work very well with the berry vinegars, both the sweetened and unsweetened (like raspberry/blackberry, which I do without added sugar, and the blueberry, which is a cooked vinegar with sugar added). I also remember those Good Seasons cruets. My mom used one for years. The inner plastic drizzle thing in your coconut amino bottle may just pop out with a screwdriver. I reused a small soy sauce bottle for years, and could just pop out that plastic thing with a screwdriver, then push it back in. Cash & Carry/Smart and Final sell soy sauce in a 4-gallon cube. I've been tempted to buy it this way, instead of the gallon jugs, but haven't wanted to deal with decanting it. But I may try the next time we need soy sauce. We buy soy in a 4-gallon cube direct from the manufacturer, because there's only one brand we like, and it's not available in our part of the state. But last time we tried to order, they said that they couldn't sell to us without a wholesale card. My MIL just gave me one of her extras, because she knows we use it more than any other branch of the family. But I'm using a locally-available soy in things where the flavor isn't quite as showcased, to try and make our stock last as long as possible. The good news about soy is that we've never had ANY problem with leaving it for ages in an opened gallon jug. We only decant into the cruet because less would spill if we spilled (and it looks less-tacky at the dinner table ). But if I'm washing the cruet, pouring a little from the jug into the cap and then over your plate works very easily (though more messily, so we only do this in the kitchen), just as we do with vinegar from the jug over our chow mein plates. I make quick oil-and-vinegar dressings for my husband like YHF (and you, but with "plain" vinegar). My husband likes them with a little dijon mustard, some Parmesan cheese, and some dried herbs, too. So, they're quick (just need to "meld" 30-60 minutes), but still very rich and tasty.